As Gregor Samsa awoke one morning from uneasy dreams he found himself transformed in his bed into a gigantic insect. He was laying on his hard, as it were armor-plated, back and when he lifted his head a little he could see his domelike brown belly divided into stiff arched segments on top of which the bed quilt could hardly keep in position and was about to slide off completely. His numerous legs, which were pitifully thin compared to the rest of his bulk, waved helplessly before his eyes.” With this startling, bizarre, yet surprisingly funny first opening, Kafka begins his masterpiece, The Metamorphosis. 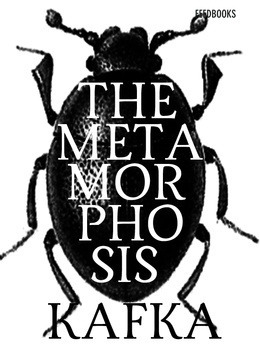 I read The Metamorphosis by Franz Kafka as the first title for my 2015 Summer Reading Challenge, this is a book that’s been studied my literature students for decades but somehow escaped me until last week. I thought I might include my views of this story before my ideas are influenced by the in-depth reviews already out there. The basic premise of this story is that a travelling salesman who’s been supporting his family wakes up one morning and discovers that he’s turned into a bug. He (understandably) loses his job and his family keep him hidden from the rest of the world, their disgust turning to neglect before he finally dies and the family essentially lives happily ever after. I think that the thing that most struck me about this story is that no-one questioned the fact that Gregor had turned into a bug, they were horrified, sickened and disgusted by him but not curious or sympathetic. They didn’t try to find out why it happened or if there was a way to reverse it, they just reacted to the situation as it was and gradually neglected him to the point of his death. Gregor doesn’t question this either, but his love of his family stays with him til the very end even though he loses himself largely to his new form and instincts. Showing that he’s maybe the least changed of all of them, given how quickly his family turned against him. Finally, the part that depressed me the most, is that once Gregor dies his family get their lives back on track – while he’s been holed up in his room they went out and got jobs (nothing stopping them from doing this before) and are now able to sustain themselves, now he’s dead they’re able to move to a place more within their means and come home without worrying about Big G the BugMonster skittering about their spare room. *Gregor being abused by his disapproving father is a reflection of Franz Kafka’s relationship with his own father, Hermann. *It’s after a particular vicious assault by his father that Gregor begins his decline, mentally and physically. This website was also particularly nifty and far more in-depth (peruse at your leisure). All in all, I don’t think I missed as much subtext as I initially thought – I like to think that I take the time to take in the deeper meaning of the things I read, but I’m also not deluded about my reading habits- I read a lot and I read fast, I probably miss out on a fair chunk of the subtext in the books I read but in this case….. I AM A WINNER! !